Google Analytics is like the board game Reversi (marketed in the US as Othello). It takes minutes to learn, and a lifetime to master. Rather than wait a lifetime, I have compiled a list of resources that will help you better understand Google Analytics, broken out by your phase of learning (with a host of filtering options). It has been my personal mission to discover everything I possibly can about how to get the most out of Google Analytics. These resources are my gift to you. This list is comprehensive, so be sure to look through everything and bookmark this page for future reference. Google Analytics is constantly changing, so we will be updating resources often to give you the most up to date knowledge. This content is underwritten by my Google Analytics Training Course. Let’s start off this guide by looking at comprehensive training programs that teach Google Analytics. There are many courses that are available online, but we will focus on the courses that I have personally vetted for the purposes of this post. The following are courses I have personally reviewed and can recommend the quality of content. 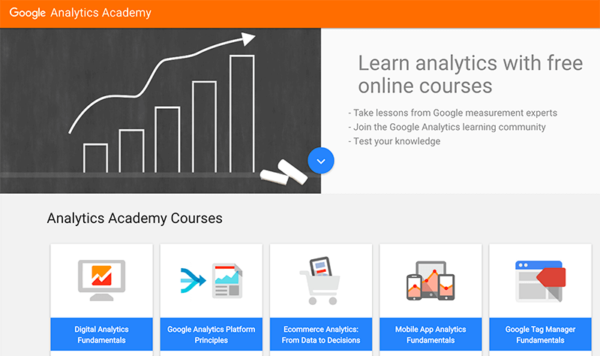 This free training course is provided by Google and covers several areas of focus in the Google Analytics ecosystem. Complete courses to receive a certificate of completion. There is really nothing to lose with taking these courses. It is a place where I recommend all beginners look for answers. The lessons are taught by Google Employees who have a comprehensive understanding of the product. If you are looking for an absolute-beginner starting point, this course is a great starting point. This course is the course that I offer to aspiring analysts and marketers looking to round out their skill-sets to include analytics. Through 33 videos, I teach you how to use Google Analytics like a pro. We start with beginner lessons to get everyone on the same page, and then quickly advance along through advanced topics that you can use to expand your skills. This course focuses on the timeless topics you will need to use analytics well into the future. How is this different than the free Analytics Academy mentioned above? 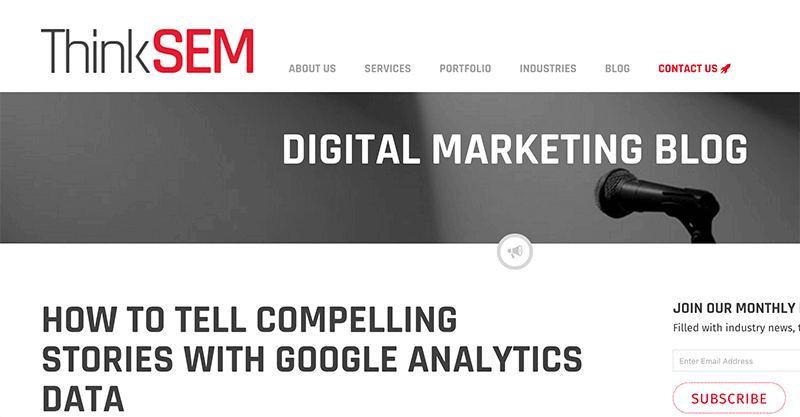 Our focus is on getting YOU to get the most value out of Google Analytics. The Google course is more focused on how Google would like you to use their product. Many people will take analytics course after seeking something more advanced than Analytics Academy. - Google Partners Account: ﻿﻿Personal or Company Email Address? If you would like to get your Google Analytics certification, ﻿﻿then﻿﻿ you will need to create an account with Google Partners. It is very easy to get signed up, and this is where you can manage all of your Google-related exams. This is also the test center for Google AdWords Certification. What I recommend that you do is first take one of the online courses that we recommend in this post. This will allow you to learn the skills that you will need to pass the exam with flying colors. 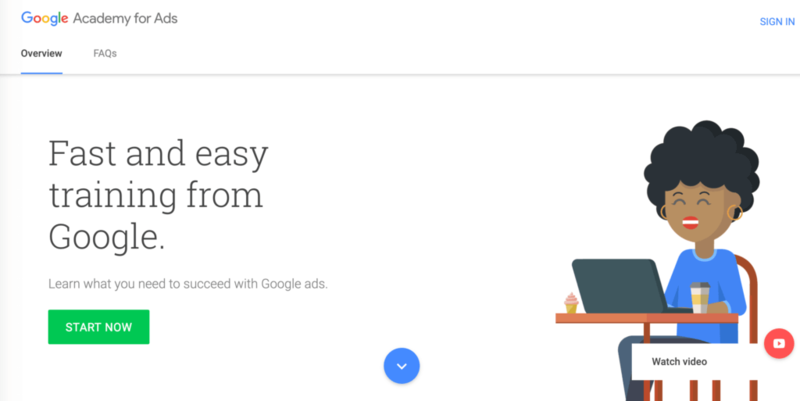 You can sign up for a Google Partners account at any time. We recommend using your personal email address before taking the exams, because certification is something that you earn individually. You can use this same account to take multiple exams with Google, and to be listed in the partner directory. One of the most difficult parts of learning Google Analytics is becoming familiar with the terminology. Learning web analytics can be very difficult when first starting out, because terms are technical (and not always descriptive). It's sort of like trying to remember all of the character names in the Lord of the Rings trilogy. 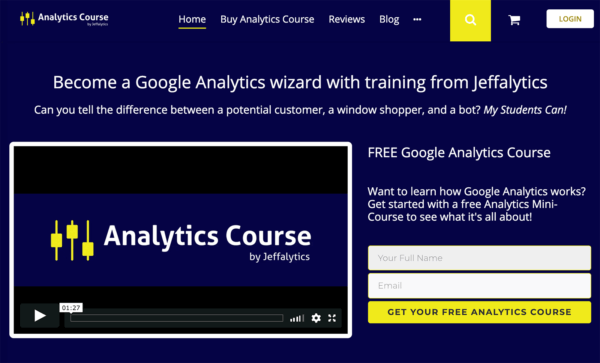 In order to help people better understand what can be done in Google Analytics, Jeffalytics has created an ongoing project to document all of the awesome things you can do! 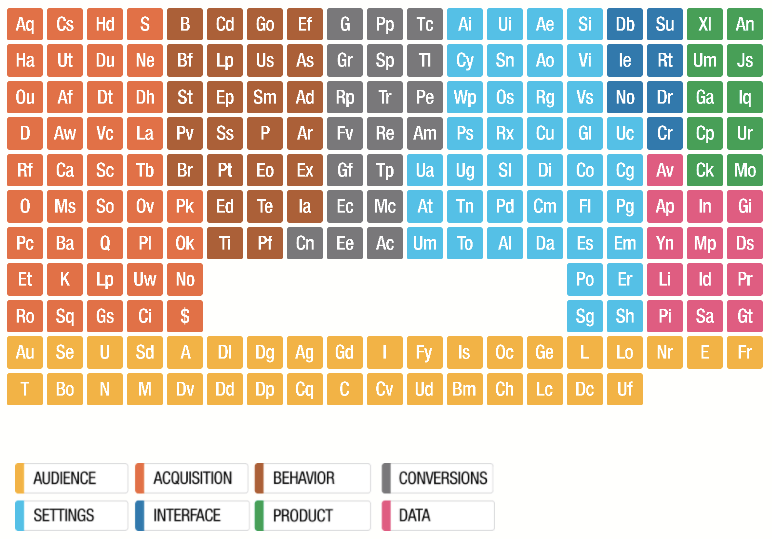 This project is called the Periodic Table of Google Analytics, and contains nearly 200 elements to describe all of the functionality that is available in Google Analytics. Do you know what all of the elements can do to help your organization? Are you getting the most out of Google Analytics? 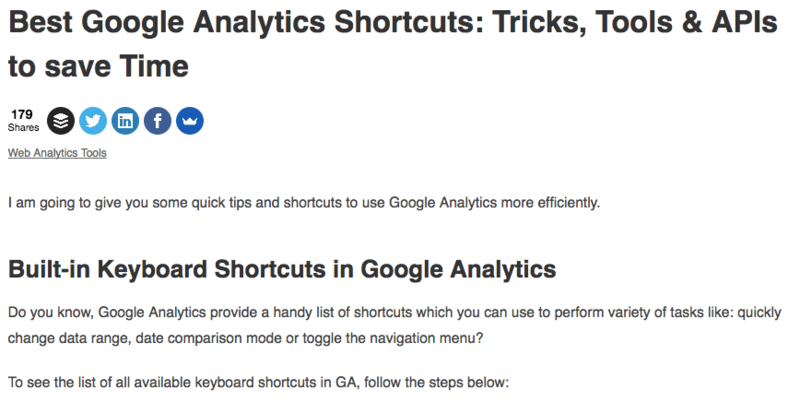 Think of this guide as the missing manual for Google Analytics. 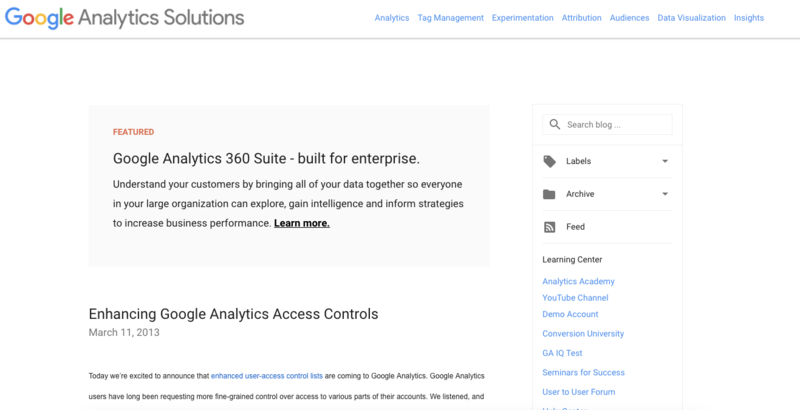 There is an authorized partner program for Google Analytics. These consultants are the cream of the crop, personally vetted by Google representatives after a rigorous selection process. If you are looking for help with your specific Google Analytics problems, this is the place to start. These consultants specialize in answering your advanced queries. 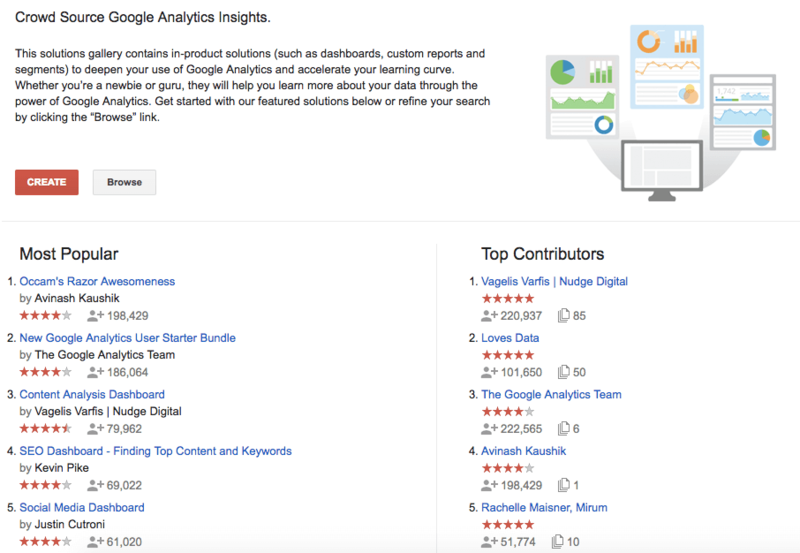 There are many awesome blogs that contribute to the Google Analytics community. So many, in fact, that we could do a dedicated post just to this topic. Instead, we will focus on three blogs that make a daily impact in our lives. Paul Koks publishes useful guides to Google Analytics several times a month. If you want to go in depth with any topic, Paul has probably written a guide. Word on the street is that he's a pretty awesome consultant as well. If you have ever wondered "Can this be done in GTM?" and then turned to Google for an answer, you probably have found Simo's blog. Simply put, it is the definitive resource for Google Tag Manager (and extending GTM in ways you never imagined). Bookmark this site to exercise your GTM curiosities! Last but not least is Bounteous. 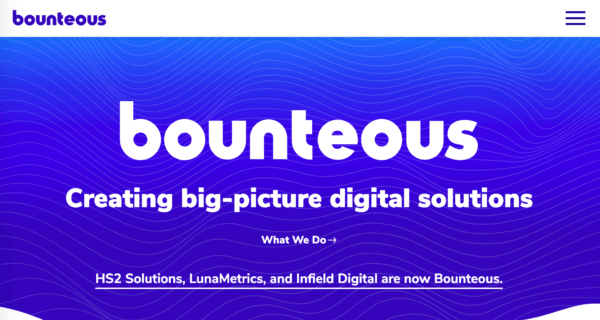 Unlike the first two blogs we recommend here, Bounteous is an ensemble of awesomeness. This Google Analytics Certified Partner writes advanced guides on specific uses of Google Analytics. These guides are pulled from their vast enterprise implementation experience. Over the years, I have delivered several presentations on the topic of web analytics strategy. Here are a few of my favorite presentations that help you understand the strategies you can deliver around analytics. Storytelling with Data and Reports: This presentation focuses on how to deliver more value from the data we collect in marketing programs. We talk about the difference between reporting and analytics, and show some practical ways to tell stories with data. Forming a digital measurement strategy: Ready-aim-fire is how it is supposed to go. But that is usually not how things actually happen in the marketing world. It’s time to avoid read-fire-aim marketing with this presentation on measurement strategy. 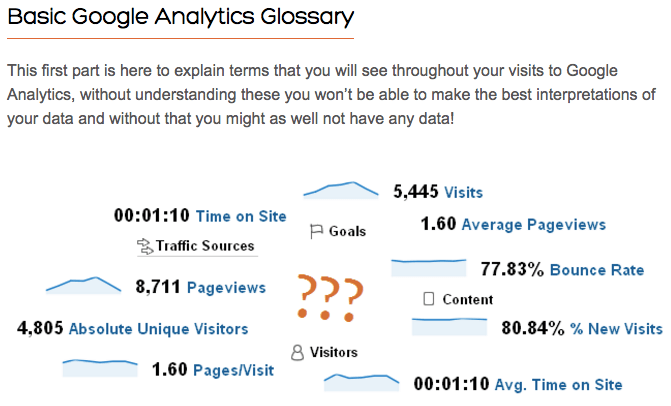 Google Analytics 101: Here is an absolute beginners guide to Google Analytics. Google Analytics for Bloggers: Have a blog and want to understand the best way to utilize Google Analytics? This guide will rock your world! For more information, be sure to check out my Slideshare channel for even more goodness. One of the first places you will look in Google Analytics is at the audience reports. While these reports have been around for many years, the most important reports in this section have been added more recently. For example, you are provided with reports within Google Analytics to report on the differences in behavior between mobile, desktop and tablet traffic. This data can help you make important decisions about your visitors. Within this section, there are a few reports that need configuration to work properly. For this post, we want to talk about specific reports that you should consider adding to your reporting repertoire. The Demographics reports in Google Analytics are easy to enable, but do have some tricky-ness to them. In theory, all you need to do is click a button and "voila" they work. But in practice, you actually need to change your entire tracking code method. The documentation casually mentions this as you go along. Pro tip: This really is as simple as a button-click to implement in Google Tag Manager. Warning: this feature may not be available in all countries. When you read a post written by Avinash Kaushik, you tend to laugh, cry and walk away smarter for having known the man's acquaintance. Occam's razor has been presenting the simplest (and often the best) solutions for web analysts for over a decade. This article is no exception. It takes you through the benchmarking reports in Google Analytics, while also teaching you to look at other data sources for additional insights. These other sources include SimilarWeb and using your the reports from industry analysts like eMarketer. There are several enhancements that you can make to the basic Google Analytics tracking code. In the most recent version of Google Analytics, these are called plugins. Common plugins that you may find useful are for using the demographics reports (mentioned above), enhanced e-commerce and linking cookies between domains. Many of these use-cases are advanced in nature, so it is important to understand their utility before implementing. Otherwise you can do more harm than good. When implementing anything new, I always recommend starting with the official Google guides. The acquisition reports in Google Analytics have a confusing name. By Google's definition, an acquisition means that your website acquired a new visitor. The simple act of visiting your website qualifies as an acquisition in the language of Google Analytics. This differs from how the term acquisition is used in other forms of marketing. But for the purposes of this guide, which focuses entirely on GA, we will stick with Google's definition. The most common areas you will look in your acquisition report is in the channels that drive traffic to your website. These "channels" are really an aggregation of the traffic sources that come to your website. When you group several traffic sources together, they become a channel. The default channels, as defined by Google Analytics, are decent. But there is a lot of configuration you can do to make them work better for your reporting needs. This section covers some of the ways that experts will customize their channel listings. Let's first start by understanding what goes into the default channel groupings according to Google. There's no better place to understand what goes into a channel grouping than to go straight to the source. 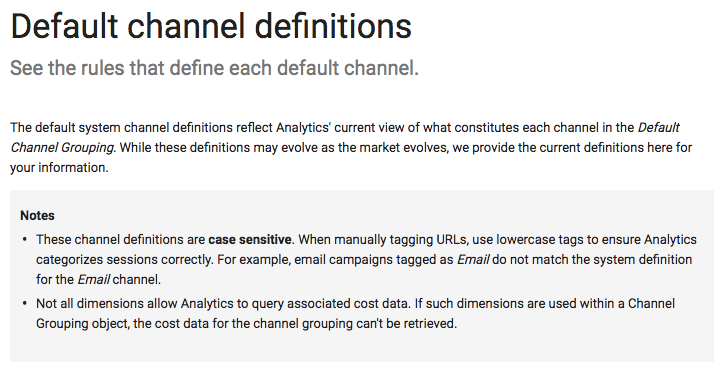 This guide by Google Analytics tells you exactly what makes up your channel definitions. Have you ever wondered what goes into the "social" channel by Google? Ever noticed that paid Facebook is showing up as PPC, when it should be considered social? This guide helps you understand why your data appears the way it does. In addition to looking at what makes your channel definitions, you may also be benefit from understanding where organic search traffic is defined. Basically, organic search traffic is another default setting that is put in place by Google Analytics. Any website that they deem "search engine" is included as organic search in your traffic and channel reports. The problem is that Google's default values don't always recognize search engines properly. So instead of showing up as organic search, these sources may show up as referrals in your reports. This handy guide from Google helps you understand exactly which traffic sources are considered to be search engine referrals. There are many creative ways for you to update your channel groupings to be more useful for your own website reporting needs. When I teach, I tell students to teach Google Analytics to speak the language of your business. One way that I recommend doing this is breaking out paid social vs. organic social using campaign tracking. Another is branded vs. non-branded search traffic (both paid and organic). Once you understand how channels work, you can get creative with naming. Just don't change the default grouping. Create your own - and get some ideas in the accompanying post. If there is one aspect of Google Analytics that provides the most "pound for pound" value, it is campaign tracking. This method of providing custom traffic source/medium data has been around since 2005, and yet is misused all the time. People are making mistakes with campaign tracking. Every. Single. Day. Why is this? Because there is almost no support from Google to make this work properly. There's no mention of traffic source data quality in the GA interface. There is an attempt to over-simplify traffic source data by showing channel groupings. And most Google Analytics users are ignorant to the fact that direct traffic is completely worthless. Let me repeat that. Direct traffic is worthless. It is the sign of a failure of a website owner to plan, and a failure by Google to provide a meaningful campaign tracking method to users. If your direct traffic is > 20%, then you have a pretty serious problem. This section will help get you educated on how to solve the problem. 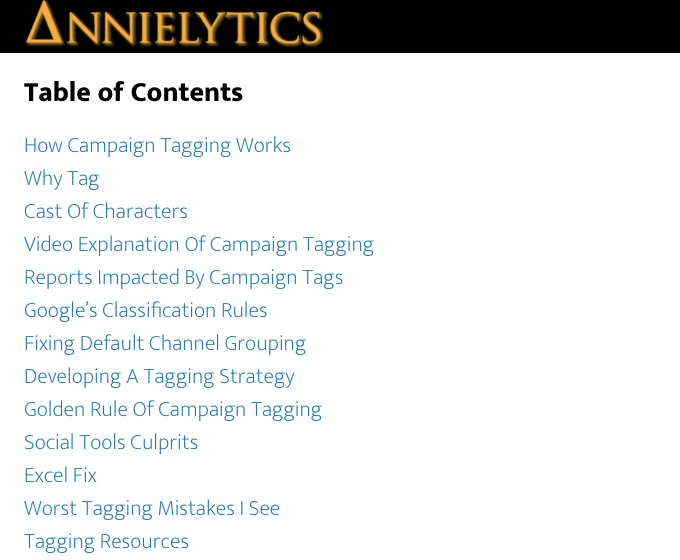 Let's start with Annie Cushing's definitive guide to campaign tagging. I chose this resource because it doesn't make assumptions at the beginning. It starts at the absolute beginning without pretentiousness. From there, Annie shows you exactly why it is necessary, and how things all come together in your Google Analytics reports. Annie is a search marketing and analytics expert who teaches analysts how to get more out of their data. If you are not sure how campaign tracking works, check out this guide and the accompanying resources. 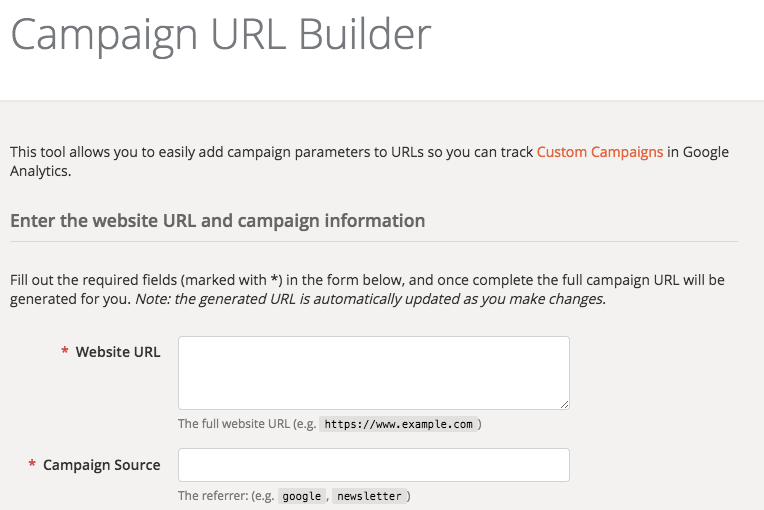 Once you understand how campaign tracking works, then you can go directly to Google and build your own campaign URLs. This can be done using the GA URL Builder. This is one of those tools that you will want to bookmark, because you will need these URLs for just about every piece of marketing that you put together. This tool has moved around a lot over the years, but the tool remains useful for everyone. If you want to better classify your traffic, but are afraid of breaking something, use this tool! Once you learn how to build campaign URLs, you will probably think to yourself "Oh boy, these are super long!" And you will seek a way to make them shorter. This is where a URL shortener comes in. There are many tools available to shorten URLs, but I tend to enjoy using Bit.ly, because they have their own built in metrics system. Google does a great job of identifying traffic that comes to your website through social media sources. But there is a somewhat hidden report that many people may not know about within GA. This report helps you track interactions with the social sharing buttons on your website. You know those like, tweet, and +1 buttons you see on every website (including on the sidebar here?) these can be tracked in Google Analytics with a code upgrade. Here's how. If someone clicks on your social sharing buttons, you can track this interaction in Google Analytics. Why is this important? Because social sharing buttons can be resource-hogs and slow down performance for your website. They can also overwhelm your users with choices. Tracking social button interactions with this code from Google helps you make informed decisions about your social button efforts. Google Analytics is based on page views. Each time a page loads, data is sent to Google’s servers. This works great for the default user if all that you want to track is the fact that a page is viewed. But if you have a dynamic or interactive website, you may find that something is missing in your reports. But let's not get too far ahead of ourselves. Let's first start by talking about what we can do with the content reports that Google provides us right out of the box. 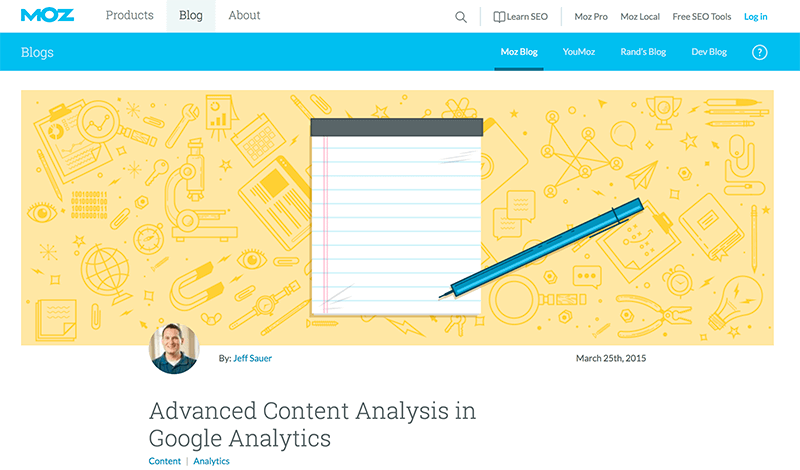 This is a guest post that I wrote for Moz that helps you understand the power of the content reports in Google Analytics. Ok, so I said that we would start this section with the basics, but this is too important to pass up. We can use these analysis methods to really understand the value that each piece of content brings to our website presence. But not only that, we can make better decisions about future content using these methods. Content grouping is a key for large sites to understand what content efforts are working! Now let's talk about some of the things that we can do with a little configuration. Your internal site search engine can be a gold-mine of useful information. Of course, you need to know where to look in order to find the gold. That is where the site search reports come in. Configure GA to recognize the URL parameters that your sites search engine uses, and you will have a wealth of information at your finger tips. Great for e-commerce sites and customer support repositories. And finally, let's address the elephant in the room this section. What happens when a page doesn't reload? What data is sent to Google? By default, nothing happens! To get Google Analytics to recognize the activities that are happening on your site, you must send some additional information to Google's servers. This is called event tracking. Events are activities that happen within pages on your site, or are simply activities that you want to track beyond the page view. 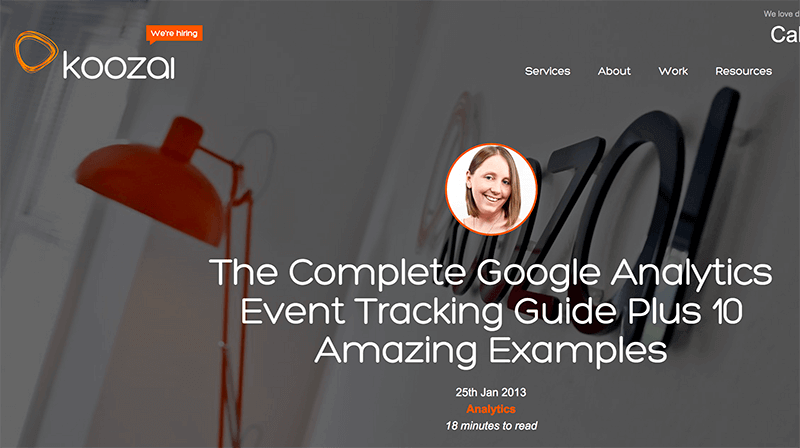 This excellent guide by Anna Lewis explains how event tracking in Google Analytics works from the ground up. If you are new to event tracking, I recommend starting with this guide before moving on to our supplemental resources. It's best to understand why events exist and the premise behind them before reading about implementation. Of course, it's better to learn implementation before automating things. So that's why these resources are presented in-order for your enjoyment. Ok, so now that you understand the concept of event tracking, it's time to see how the code works. As with most code matters, I like to recommend starting with the official Google documentation site as a starting point. This is no exception. We want you to check out the guide to event tracking created by Google. Once you master this, then it's time to get schwifty with some automation. Now that you understand why we do event tracking, and how it works, you probably are thinking "daaaang, that's so much code to put on my website! This will take forever!" You're right. It does take forever if you tag every single event on your site manually. It's a fools errand. That's why smarties from all over have devised a method for automating this process. 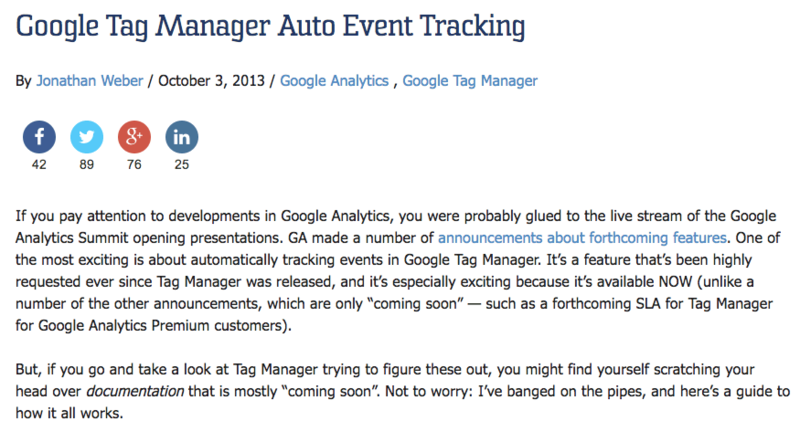 My favorite way to automate event tracking is through Google Tag Manager. Here's a great guide on the subject. Note that this is based on GTM v 1.0 so some functions have changed since original publication. Your answer to this question will determine the best way to configure Google Analytics to your advantage. If your website exists to sell products, then you will want to make sure you have E-Commerce tracking set up. If your website exists to generate leads? Then you can probably get by with only setting up goals. Regardless of your website purpose, you will need to set up conversion tracking. It is the only way you can measure if visitors resulted in the outcome you expected. Setting up goals is ridiculously easy for most websites. Setting up e-commerce is a bit more complicated. Here are a few guides to get you started. 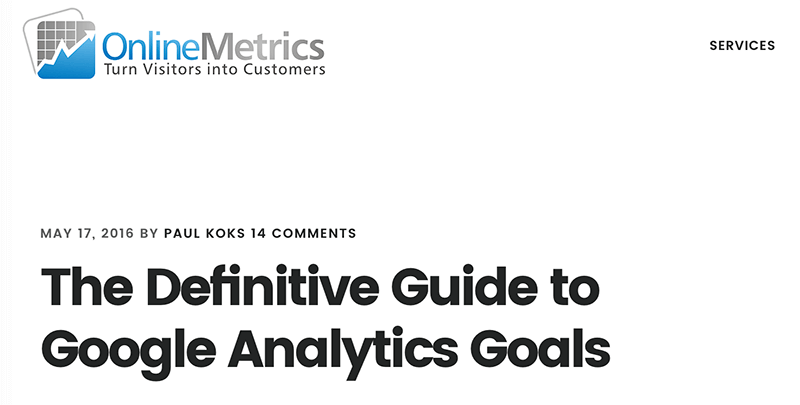 There are many guides to Google Analytics Goal Tracking floating around, but this one is the most recent and among the most comprehensive. Goals have been in Google Analytics since the product was introduced in 2005. Yet I see them implemented incorrectly in nearly every account I observe. Sometimes this is due to website updates (new conversion points, undefined) and sometimes it is user error. Guides like this will help you make sure you are doing this right in the future. While only about 10% of the websites I observe actually have a shopping cart online, these websites that sell online will benefit the most from a robust analytics implementation. 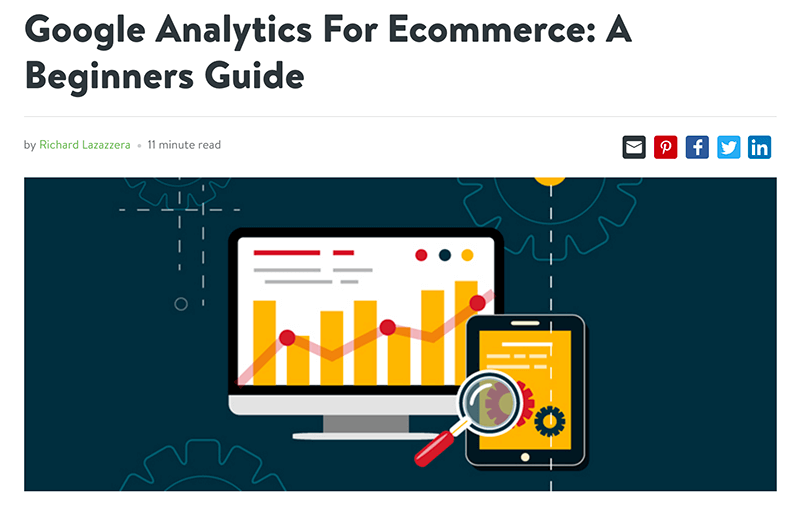 Here are some guides that help you understand how to implement E-Commerce in Google Analytics. If you don't find the Google documentation to be useful (it can be confusing), then we have some third party guides as well. Let's start with a beginner's guide to e-Commerce tracking and go from there. This guide sets the tone for what you need to understand when it comes to implementing E-commerce in Google Analytics. Note that this guide is written on the blog of a shopping cart provider. Many times, your shopping cart provider will have and integration with Google Analytics that allows you to click a few buttons and get these reports in place. If you do not have a cart that does this, then you may want to consider upgrading to something more modern. Google Analytics is on 83% of all websites and has been around for 10 years. No shopping cart should be surprised at this point that GA exists or people want to use it. With that said, if you can't just click a button on your cart, you will want to look at the additional resources we provide below as well. If you need to go through the painstaking process of adding e-commerce tracking to your own site, you will want to start with the Google official guides once again. These guides provide methods for getting things set up, code samples, and practical resources. But they do not provide platform-specific recommendations. This means they don't provide code for your programming language (PHP, ASPX, etc. ) or for your specific cart software. This is where things get tricky, and you may need to hire a professional to get things working. There really should be no reason that you need this code, since everyone should be on the Universal version of Google Analytics by this point. But just in case you still have a holdover in your shopping cart integration (or a militant development team), I'll leave this in here for one more publication of this list. But you are officially on notice. 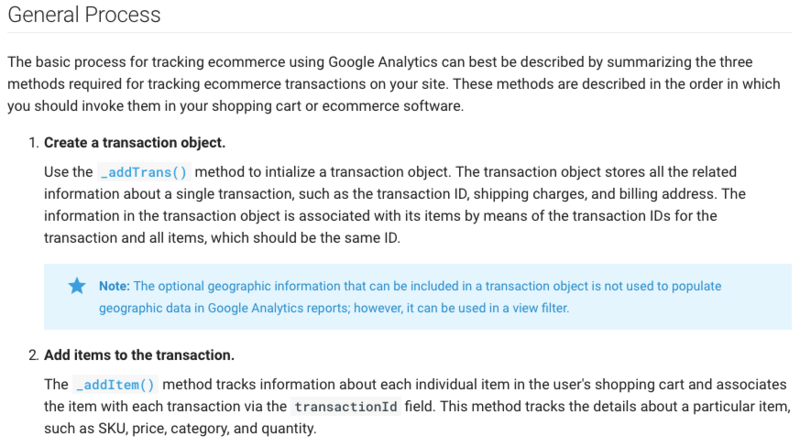 With that out of the way, I do think that the documentation from Google on E-Commerce tracking has gone downhill in Universal Analytics. You may want to read this for better overall understanding. Here's yet another case for using Google Tag Manager to maximize your site's measurement potential. Through GTM and their data layer, you can pass shopping cart values into GTM with ease, every time someone purchases. Here is Google's official guide on how to get this working. But always remember, this is generic information for everyone, which may mean you need another source of information to pull things off. Want more from your e-commerce reports? Don't we all! After several years of no changes to e-commerce, enhanced e-commerce came along and gave these reports a desperately needed upgrade. Check out this fantastic resource for tips on getting started. Now that you have an understanding of the reports in Google Analytics (and how to get more data out of them), it's time to start looking at the overall governance process of your account. There are many methods that you can employ to get more meaningful reports, and there are also settings that you can enable to maximize the value you get out of Google Analytics. Let's get right to the resources. Within Google Analytics, you can control access to users at several levels. The first level is at the view level, which is the most limiting form of access you can provide a user. You can give access at a property level to limit control to a single domain name at a time. Or you can give access to an entire account. Within access control, you can also decide if someone has read-only access, collaboration access (where they can view shared resources), edit access (where they can edit your account and potentially cause damage) and last, the ability to add new users. P﻿aul Koks is at it again with this guide to filtering your views in Google Analytics. Filters act as a way to limit the data that gets into your Google Analytics account. The analogy that I like to use is that of an air filter. Do you want to breathe air with pollution in it? Or do you want air that is filtered free of pollutants? What about your data? Do you want it polluted with junk, or do you want it clean? This guide explains how to get clean! If your website is using the analytics.js version of Google Analytics, then you can safely skip over this resources. But if you're still using the legacy code, the next two resources will be very useful for you. 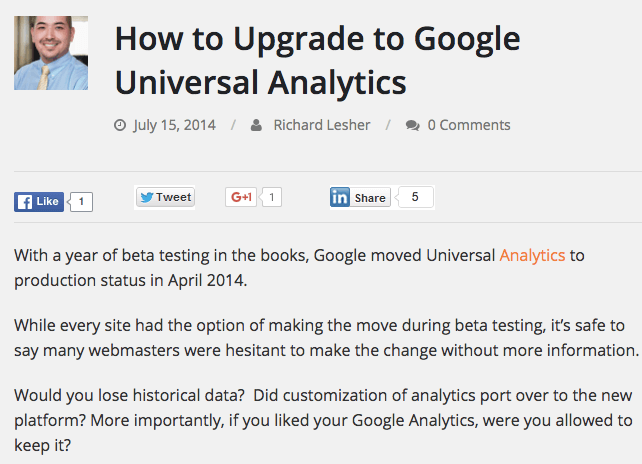 Let's start with this guide on how to upgrade to the Universal version of Google Analytics. What is Universal Analytics, you ask? Well, it is basically a better version of the GA tracking code. It has a lot of enhanced tracking methods, has a smaller footprint and allows for tracking people across devices. It's great. Worth the upgrade. Here's the deal. If you have not upgraded to Universal Analytics yet, then I'm sorry for you. Not just that, but I think you should rip off the band-aid and upgrade to Universal Analytics and implement Google Tag Manager at the same time. Why would I say such crazy things? Because I am assuming that it takes you like 5 years to get your website updated. Moving to GTM would reduce your development cycle significantly. And then you can spend all of that extra time measuring the crap out of your website. And then there is all of that SPAM data in your Google Analytics account. For some of you, you'll find it unbelievable that I got this far without addressing the elephant in the room. Others are sick of hearing about SPAM in Google Analytics. For years, I have been outspoken about Google's absolute failure to protect their users from SPAM. I have complained, gotten reprimanded, and even proposed a solution. I have had conversations with many practitioners on this topic, and yet there is no solution. I'm not going to get into depth on why this happens in this guide. But I will provide some resources. 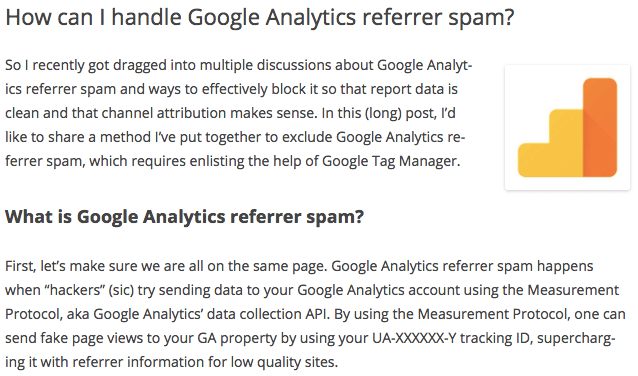 This post from Julien Coquet provides a great overview on how to handle Google Analytics referrer spam. Julien has been in this industry for years, and is a recognized Google top contributor for his participation in the online communities that Google provides to users. What does that mean? When Julien writes, you listen of course. One of the first times I was introduced to Mike Sullivan and Analytics Edge was through his tireless efforts to identify and remove SPAM from reports. Analytics Edge maintains an awesome guide to referrer spam in Google Analytics, and updates it constantly. If you are plagued with a junk data problem, be sure to bookmark this resource. There are two main ways to upload data into Google Analytics. One is to use measurement protocol to write a program to push data into GA. The other is to use the data import function. Data import function allows for programmatic uploads or CSV file uploads. Here is more info on each. In other words, your code or plugins are really just disseminating user data into a format Google can understand. This is why I don't really have a recommended method for sending data to Google. It's all going to Google in the same way. Product Data: import product metadata, such as size, color, style, or other product-related dimensions. Custom Data: import custom data sets. Continuing from the data import ideas from above, you can also save time by automating the data upload process. For larger companies, you can have your development or business intelligence teams use APIs to send data to Google on a consistent basis. If you do not have these resources in-house, then you can use third party tools that handle this for you. One of the ways that we recommend to automate this process is by using the Supermetrics Uploader tool. Want to do more to extend the functionality and utility of your Google Analytics data? There are hundreds of Google-endorsed partner applications that you can use to perform myriad tasks and extend your data analysis capabilities. Simple visit the Google Partner Apps gallery to see what is available and at your fingertips. There are tools available that will help you accomplish just about any task you need to accomplish with data. Not only that, but you will probably find some innovative and inspirational ways to process data as well. This place is an idea machine! One of the places where Google Analytics becomes most valuable is when you can take data out of Google Analytics and pare it with your other business data. Fortunately, there are many ways that you can do this. In fact, when you go to the Google Partners gallery, there are 78 applications dedicated to data export and reporting capabilities. Since this post is already really long, I am not going to review all of the applications right here. Instead, I will just mention a few notable resources that I think you will enjoy. Create beautiful data driven dashboards in minutes. This tool drew my attention because of the sheer beauty of the reports and templates available. This is the most beautiful way to present your analytics data online. But what really makes this tool attractive is that the integrations with several systems that marketers use on a daily basis. Their GA integration is a great starting point, but it's their integration with advertising systems that makes this software shine. Using just one dashboard tool isn't very fun, is it? I always recommend trying several options to see what best suits your needs. Cyfe is a dashboard tool that offers many of the features that you find in Klipfolio, but with their share of unique reports as well. Even better, Cyfe offers a free version of their tool to get started. So if you are looking to get some experience, Cyfe is an excellent starting point. 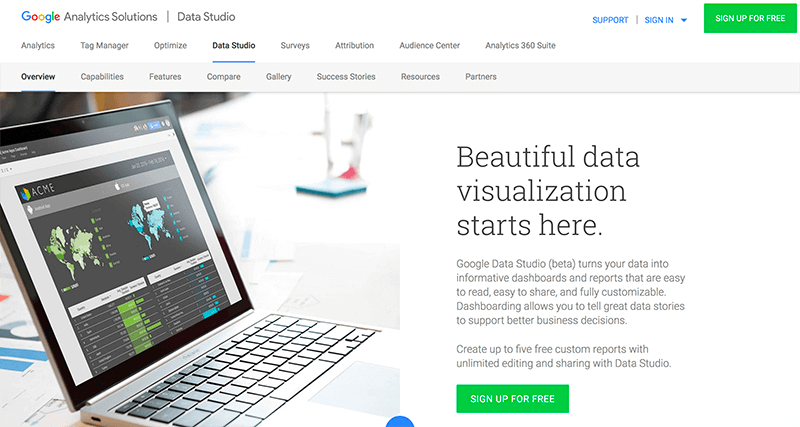 A recent addition to the marketplace is Google's data studio product. This powerful product is fully FREE to all users, and provides you with a canvas to build powerful reports. This product is still in the early stages of development, but the amount of resources and momentum Google has put behind the product is pretty remarkable. The biggest complaint I have right now is that it's mostly limited to interaction with Google products. But there are ways around this by tapping into Google sheets, SQL databases and other data collection methods. I suspect that with the product becoming free for all users as of February 2, 2017 - a lot more innovation is forthcoming. This is the most exciting GA product development since Google Tag Manager. I used to spend 20-40 hours a week delivering reports to clients. Most of this time was spent downloading, correcting and formatting data. Then trying to form a narrative around the data that I was seeing. It was gross. Quill Engage basically does all of this heavy lifting in a matter of minutes. Sure, it doesn't help with "correcting" of data, and not all of the insights are that insightful, but this is a major time-saver for your reporting needs. When you factor in the costs of the product, I would be paying just a few cents per hour saved over manual reporting. Google Tag Manager is so important that it gets a dedicated section in this guide. It's becoming so ubiquitous in our web analytics process, that it's easy to take this wonderful tool for granted. It can do so many things, and do them well! While trying to think of an analogy for the utility of GTM, one thing came to mind: duct tape. Google Tag Manager is sort of like duct tape for your website. It holds things together, it's strong (yet pliable). It's not always pretty, but it gets the job done. The people who make the web work appreciate GTM as a wonder-tool for getting things done. Much like duct tape. 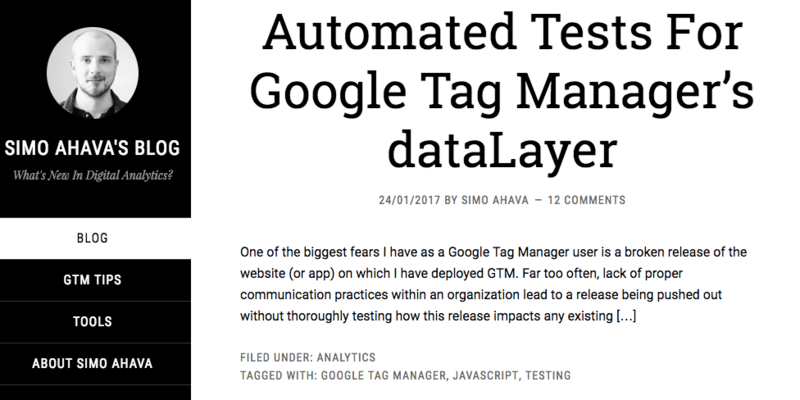 So what is Google Tag Manager? Well, a tag is the term we assign to all of the tracking codes (or scripts or tags) that you place on your website to perform analytics and reporting functions. GTM manages these tags for you in one place. But of course, it's much more than that. It's a performance tool, an imagination tool, and a safety net for your future measurement needs. And it's somehow more than that. Of course, we have several resources to help with GTM. To get started with Google Tag Manager, check out the Google Guide. And also the Google developer guide. So there is the official Google Tag Manager documentation. It's pretty good, but there is a better resource. The unofficial guide to GTM, and it's written by some guy in Finland named Simo Ahava. I didn't think that this person actually existed, and then I met him in person and we became fast friends. He even came over for enchiladas in San Francisco and we ate reindeer carpaccio in Helsinki. I have such a man-crush on Simo Ahava that I mentioned him in this guide twice. This may be a sign the guide is getting too long, right? Anyway, here are some great GTM resources. Ok, we are on the home-stretch of this guide. We close things out by featuring several tools that you can use to extend your Google Analytics experience. Some of these tools will enhance your GA data, while others actually provide alternatives to the functionality mentioned in Google Analytics. For each tool we will provide a synopsis for when they can be best utilized. Since WordPress is the most common CMS in the world, it is also the most common place for Google Analytics to be installed. For most WordPress users, it's best to use a plugin to install Google Analytics (instead of adding code to their site directly). This is because many WordPress users are not technical. For years I advocated using a WordPress plugin to get this job done. This plugin was called Google Analytics by Yoast and took the basics of Google Analytics and added several layers of customization on top. 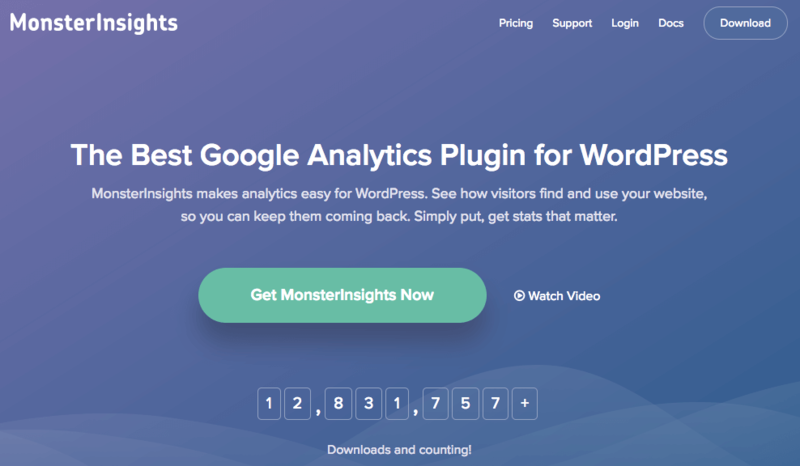 This plugin was recently purchased and rebranded as Monster Insights. While I have moved away from this plugin in favor of Google Tag Manager, I still recommend for WordPress users not looking to touch code. Did you know that there are several methods to speed up your use of Google Analytics? Yes indeed! This article provides a handy guide for how you can speed up your GA workflow by using keyboard shortcuts, bookmarks and several other advanced methods. Consider this to be a life-hack for Google Analytics, which I assume is an important part of your life. After-all, we are 5,000+ words into this post at this point. Must be important! In one of the sections above, we talked about Google’s benchmarking tool. While I find this tool to be useful, it is anonymous. Anonymous data is nice, but doesn't really help with targeting your competition. In addition to the data you collect from Google Analytics benchmarks, there are some other tools that I recommend for gathering competitive intelligence. 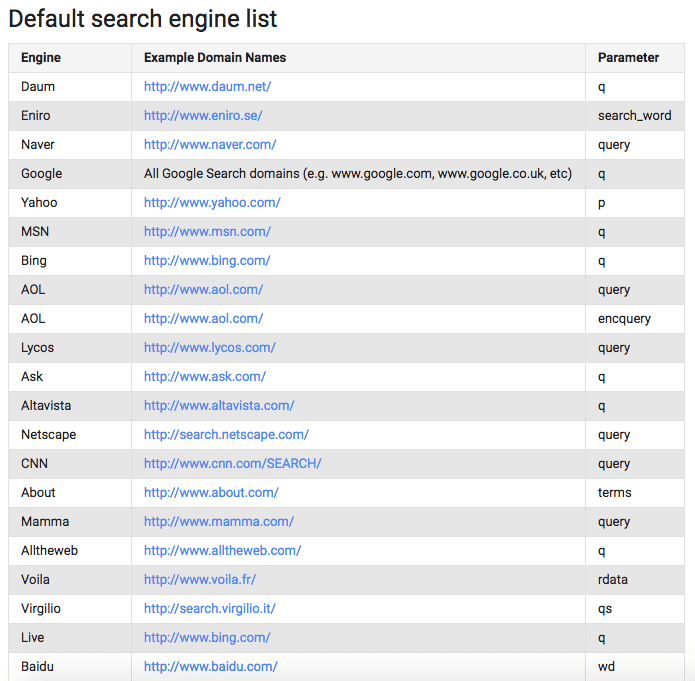 If you are looking to understand how much money your competitors are spending in paid search campaigns (and what keywords they are targeting), Spyfu can be very a helpful companion. Learn about estimated ad budgets of competitors, see their ad copy samples and even get a list of keywords. Free to get started, with charges coming with the more features you use. Another awesome competitive intelligence tool for online advertising. This service is very comprehensive and contains data on many advertisers. You can use this data in addition to your own analytics data + Google Benchmarks to triangulate results and make informed budget decisions. See embedded video below to understand how this method is possible. ​This video and companion blog post is designed to help you project your marketing budget using data-driven analysis. The process involves paying attention to several data sources and coming up with a set of numbers that you can comfortably use to establish a budget. One of the most difficult objections to overcome with competitive intelligence tools is the accuracy of data. To these objections, I say: this is the only data we have. Part of being a great analyst is to get comfortable with incomplete data being a reality in our lives and NOT let it get in the way of doing our jobs. This video helps get over some of these fears. Google provides two tools to help you test the impact content has on conversions. Google content experiments is not a testing method that I have advocated in the past. There were just too many flaws. Google Optimize is showing great promise, and I am currently evaluating this tool to provide a recommendation. Regardless of what Google provides, it is also recommended that you look beyond Google and utilize other tools. Here are some tools that we also recommend investigating. First of all, it's a good idea to get familiar with the math that goes into determining who won a split-test. There are statistical models built into each A/B testing platform, and they all represent their own interpretation of statistics. For this reason, many testing experts recommend using an independent test guide to make sure your experiments are run in a statistically valid way. Look no further than the AB Testguide. If you want to build an entire marketing funnel that utilizes the principles of A/B testing, Clickfunnels is an excellent tool to add to your arsenal. This tool requires a deep knowledge of marketing to work effectively, but the software is also paired with top-notch marketing advice to help you along your path. This software helps you build a landing page in minutes and also provides strong A/B testing support. 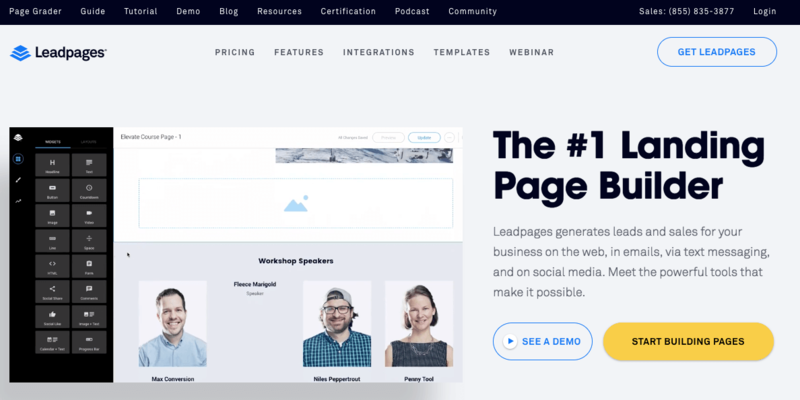 It's probably the easiest landing page builder I have used. But the technology is not flawless, especially with how it integrates into Google Analytics. It's pretty dismal on this front. They make GA data tracking very difficult. Fortunately, they have their own metrics system for measuring your test results. But honestly? They have created a data silo that I can't advocate for analytics professionals. This platform provides many of the testing tools we have mentioned above, and also specializes in landing pages for PPC campaigns. Their integration with Google Analytics is robust as well. Within Google Analytics, you will find site speed reports. These reports show you data based on a sample of 1% of your visitors. These reports show you how long it took for these users to fully load your page. Unfortunately, these reports are fairly useless if you ask me. They seem to be based on an alternate reality. As if they are alternative facts. So I recommend that you use these tools instead! ​Run your website URL through this handy tool and you will gain a strong understanding of exactly what is needed to fix your website speed. Specifics are important for making fixes, and this tool delivers the goods. The GA reports simply say your site is slow. This helps establish a plan to fix the problem. ​This tool from Google is a very useful way to check if your website is becoming a problem for your visitors. Are your images optimized? Are you over-relying on scripts to deliver content? Learn more with this handy tool (and yes, I learned that there's quite a bit of cleanup needed at Jeffalytics in this process). We are on the home stretch now! Here are some more tools that you should place in your analytics tool-box that didn't fit into a specific category. Be sure to enjoy and utilize these as well. Use this tool to understand how Google's search crawlers view your website. With reports on search crawls, you can optimize your site for better coverage. But the killer analytics tool here is the fact that you can get search query and landing page data from right within the interface. You can even link this data into Google Analytics for all of your viewing pleasure. Just note that this data only goes back 90 days. To go back further than that, you will have to proactively download your data. Do you find all of this tracking to be creepy? Well, we all should probably feel a little creeped-out by the technology out there. Did you know that you can opt-out of all of this tracking by installing a browser extension? This resource provides more information about how this works. This is an all-in-one wonder tool that is a perfect complement to Google Analytics. You can offer website surveys, track heatmaps and get to know your users intimately with Hotjar. Even better? There is a tag within Google Tag Manager that helps you get started. Last, and possibly least is the Google Analytics Gallery. This gallery is a repository where you can install the dashboards, custom reports and advanced segments of other marketers and analysts. Why do I say least? Because this awesome feature isn't updated very much anymore with new content. It feels stale. But maybe bringing it to your attention here will change that? What do you say? We hope you love Google Analytics as much as we do! My hope in compiling these resources is that you will feel inspired to get your Google Analytics Certification and grow your skills in this emerging industry. Analytics is a 50 year career. If you are just getting started (or seeking a change in career direction), then you have plenty of time to perfect your expertise. It would be great if you found these resources useful. And even more exciting if you shared this post with your friends and colleagues. And lastly, this guide will be updated often, so please tweet me with an addition you would like to see or leave a comment. Of course I should give fair warning: your content has to be EPIC to be included. No bush league psyche-out stuff man.